He is a Poojari at the local temple. 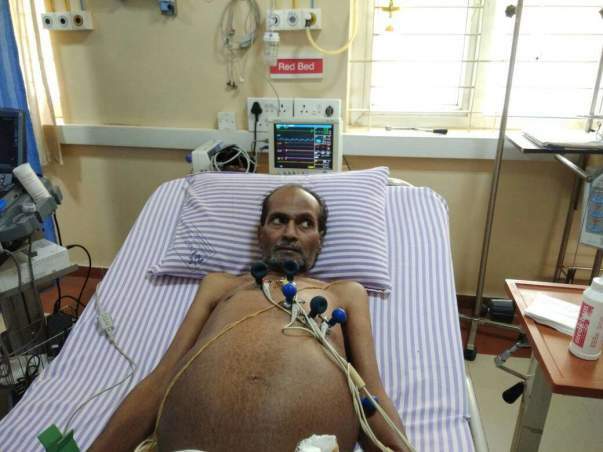 Srinath has been coming to this hospital for 4 years now. 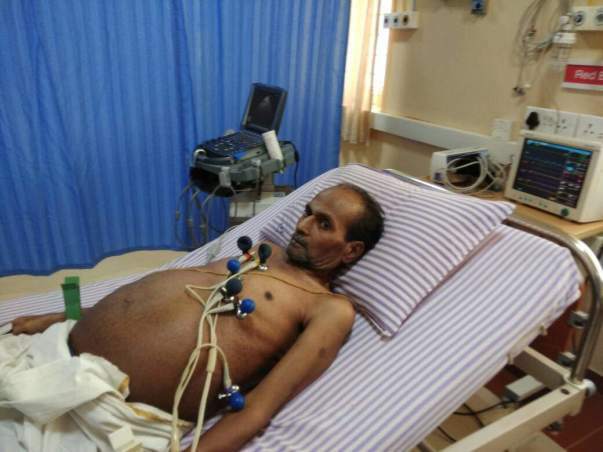 He was having chest pain, and it aggravated. They neglected it because they could not afford treatment. 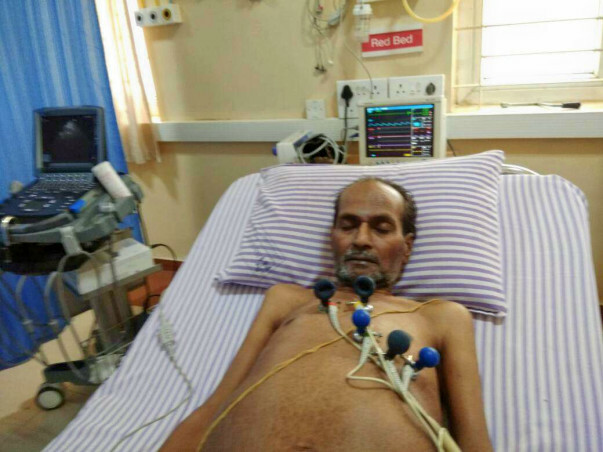 He had a heart attack which is when his wife Madura rushed him to NH here in Davangere. His valves were very weak. We diagnosed him with ischemic cardiomyopathy (enlarged heart). At that time, his vessels were extremely dilated and his condition was fragile. We could not operate on him. "We could not even afford treatment. He was suffering so much that my son had to quit college for a while to care for him. The doctor said that he was very weak and they will not go ahead with the surgery. I was scared that we were going to lose him. All those years of serving the Lord earned us some punya. Srinath managed so far on medication but every few weeks we return to the hospital because his pain gets too intense or fatigue hits him hard. 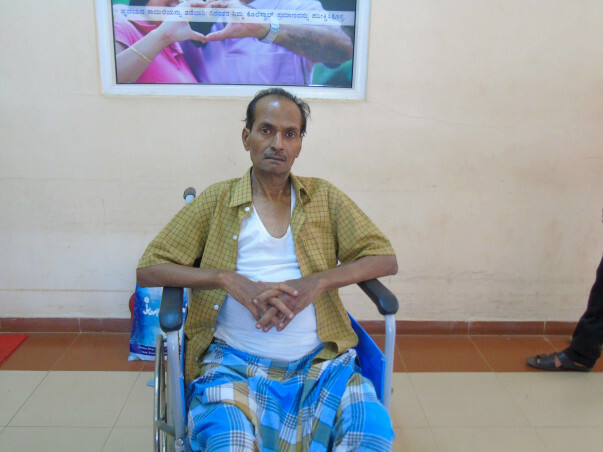 When the doctors said his condition was stable enough for surgery, our financial situation had deteriorated." Srinath earns around Rs. 5000 as a purohit. 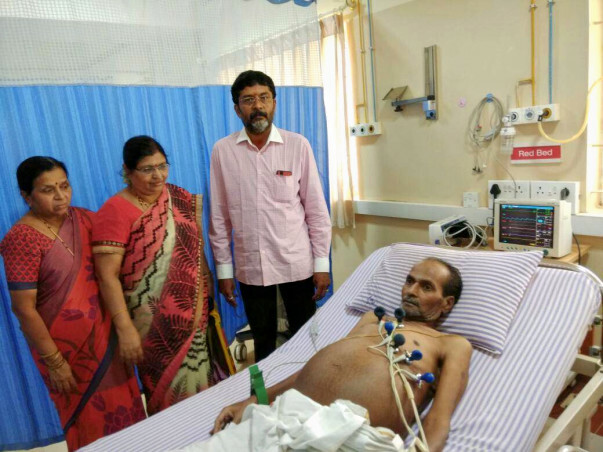 He tries to take on more jobs and get a few hundred rupees when he can to support his medical expenses that amount to Rs. 5000 a month, in addition to his son's education expenses. As for their household, thankfully, it is taken care of by the temple committee. We have given them a lot of discounts on medicines and treatment costs. Yet, they have faced financial troubles and sometimes had to discontinue their son's education. Although he is a brilliant student, the fluctuations in his father's health and emotional trauma at home is extremely stressing and interferes with his academics. "People say he is so old, and we should not waste everything trying to avoid the inevitable. I ask them all this - if their loved one is suffering or dying, would they just stand and watch because it is inevitable? It is human to save someone. It is LOVE to do everything you can to save your family. I want to make sure my husband survives. I need help! Please, please, help me!" 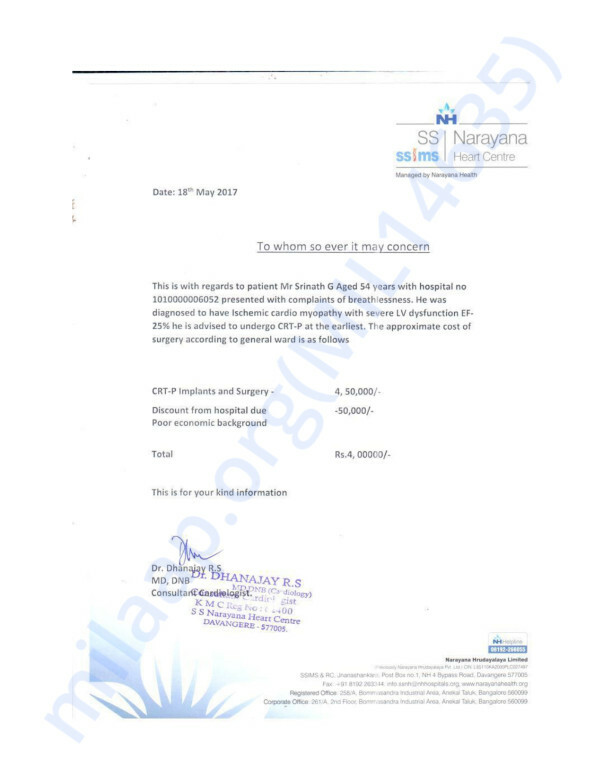 We have reduced the fee for this surgery. This family needs Rs. 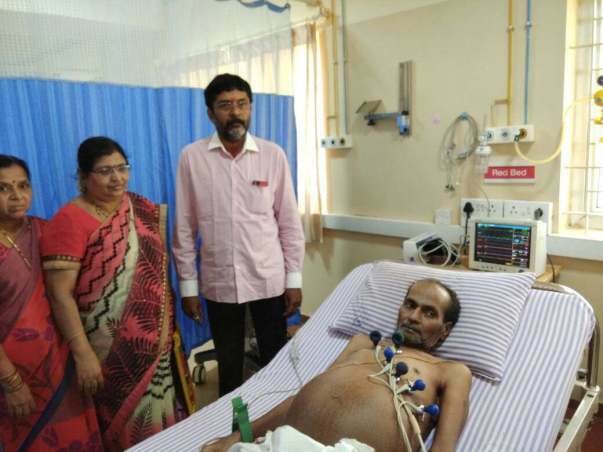 4 Lakhs to get Srinath recover from a terrible heart condition. You can help relieve all three of them from their long-time emotional distress.